Commercial Services from Stafford Mechanical Services, Inc. When you need HVAC services for your commercial space, you should know Stafford Mechanical Services, Inc. is ready to help you. When you choose us for commercial services for your business, you’re choosing a heating and cooling company that offers a wide range of products and services to meet your needs. We are fully licensed and have the experience needed to offer a wide range of services for your commercial buildings. Choose Stafford for all your commercial HVAC needs. HVAC Maintenance: Keeping your commercial HVAC systems properly maintained is the best way you can ensure their effectiveness and efficiency, and avoid costly breakdowns. Stafford Mechanical Services, Inc. is pleased to offer our commercial clients comprehensive HVAC maintenance for their entire system. Our plans will help keep your building’s HVAC system in top shape, and help you avoid downtime. HVAC Repair & Replacement: Nothing is worse than having the HVAC system in your building suffer a breakdown. But, if it happens in your commercial space, you can count on Stafford Mechanical Services, Inc. to provide you with the HVAC repair you need. Our fully licensed technicians have a thorough knowledge of commercial systems. You can count on them to provide you with expert repair and replacement services. Commercial Energy Audits: Is your commercial space as energy efficient as it could be? If you’re not sure, you can trust Stafford Mechanical Services, Inc. to provide you with a thorough energy audit. We work with your local utility company to target areas where we can conserve energy for your buildings, many times finding incentive money to offset the costs associated with energy-conserving upgrades. Energy Efficient HVAC: Today’s businesses know that energy efficiency is not only good for their bottom line, but also for the planet. One way you can help do your part is by choosing an energy-conserving HVAC system, expertly installed for you by Stafford Mechanical Services, Inc. We’ll provide you with high-quality equipment build to ensure energy efficient commercial heating and cooling, now and for years to come. Ductless Split: For many commercial spaces, ductwork that’s inefficient can cause heating and cooling issues throughout the building. Where it may be impractical or impossible to install new ductwork, a ductless split system from Stafford Mechanical Services, Inc. They offer precise, zoned heating and cooling for numerous commercial applications, such as data storage rooms, after-hours offices, historic buildings and kiosks. Building Automation Systems: You’re a busy executive, and time is at a premium for you. Wouldn’t it be nice to know you could have complete control over your commercial space’s HVAC system from your computer or Smartphone? You can – when you choose a building automation system from Stafford Mechanical Services, Inc. We proudly offer one of the most advanced building automation systems on the market today. Rooftop Units: Stafford Mechanical Services proudly offers our commercial clients a full range of services for their rooftop units. Whether you require new rooftop unit installation, or need maintenance or repair for your system, we will be pleased to help you. Not to mention, we provide our commercial clients with high-quality rooftop units that will provide you with the reliability and durability you expect and need for your business. Cooling Towers: When your commercial facility needs a cooling tower, Stafford Mechanical Services, Inc. can help. Our highly trained technicians will analyze your needs and provide you with the best cooling tower system for your commercial space. Our cooling towers are specially manufactured to provide reliability, durability and reduced operational noise. 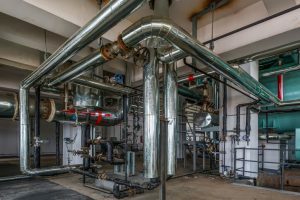 Commercial Boilers: If you need commercial boiler installation, maintenance or repair for your business, you can count on Stafford Mechanical Services, Inc. to help. We proudly provide the industry’s best boiler systems, installed for you by our talented team of expert commercial HVAC technicians. And, we’re able to provide maintenance and repair on practically any commercial boiler system on the market, for minimal downtime. Oil to Gas Conversions: Due to fuel costs, many businesses are choosing oil to gas conversion for their commercial systems. When you count on Stafford Mechanical Services, Inc. to help, we’ll provide you with a smooth transition from oil to gas. As a result, your commercial space will promptly enjoy better comfort as well as energy efficiency. Chillers: When you need a chiller for your commercial space, count on Stafford Mechanical Services, Inc. to assist you. We offer commercial chillers that are built to last and provide you with efficiency and environmentally sound refrigerant. They are durable, and highly reliable. What’s more, we can service and repair virtually any make or model of chiller on the market today, so you can count on us for all your needs. Commercial Ventilation Systems: The ventilation in your commercial space is important. The right ventilation keeps your air fresh and healthy for both your employees and clients. Stafford Mechanical Services, Inc. provides you with the commercial ventilation system you need for your building. Our systems provide fresh air at maximum efficiency, reliability and durability. Dehumidification: If you’re dealing with a humidity concern in your building, Stafford Mechanical Services, Inc. can help. We provide commercial dehumidification that will allow your space to be moisture-free. Our systems are perfect for the prevention of mold, mildew and bacteria growth, and that helps keep the air you’re breathing fresher and healthier, for you, your clients and your employees. Humidification: Are the floorboards in your office creaking? Are your employees complaining about flaky, itchy skin and overly dry sinuses? If you’re concerned that the air in your commercial space is too dry, then it’s time to give Stafford Mechanical Services, Inc. a call. We’ll provide you with humidification equipment that will help to perfectly balance the moisture in your building. Commercial Heating: Keeping your building warm during the cold winter months is important for your clients and employees alike. When you need commercial heating installation, maintenance or repair, you can count on the experts at Stafford Mechanical Services, Inc. to meet your needs. We are able to provide our commercial clients with top-quality heating products, installed for you by our skilled team of commercial technicians. No matter what your commercial HVAC need, Stafford Mechanical Services, Inc. is ready to assist you. We proudly service Carrier commercial equipment and many other brands as well. You may contact us via phone at (860) 684-9485. We look forward to helping you with all of your commercial HVAC requirements.